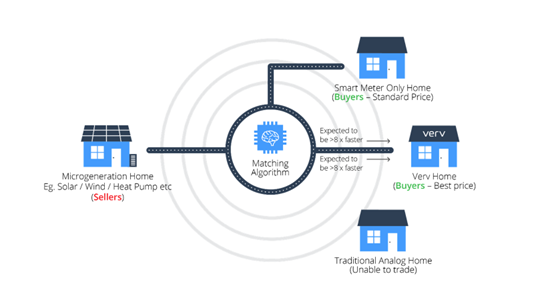 Technology needs to add real value, according to Davies, and for the connected home, initial value is created by managing energy and then multiplied by monetizing excess grid-edge power generation in a peer-to-peer exchange. 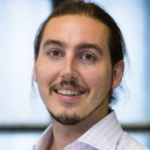 The key to this is data, he says, specifically, energy data, extremely granular energy data, something he’s been working on since 2009 at Green Running (www.greenrunning.com), a London-based team of data scientists and machine learning experts he founded, and Verv (www. vlux.io), an intelligent energy technology company established in 2015, of which it is a part. 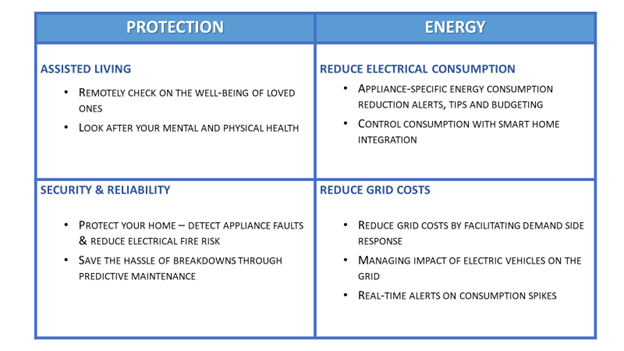 The Verv Home Hub, which is already generating revenue, enables consumers to own their personal energy management with powerful analysis tools and unique learning abilities that provide insight into home electricity consumption. As a result, they are able to reduce their energy use, minimize their carbon footprint and bring down their bills for electricity as well as to avoid accidents with safety alerts when an appliance has been left on for too long and to detect when an appliance is faulty or deteriorating and wasting power. Verv’s new layer of intelligence uses IoT and AI to identify key appliances and monitor the amount of energy each uses. The Hub attaches directly to the electricity meter with a current clamp, so it can “listen” to electricity usage. 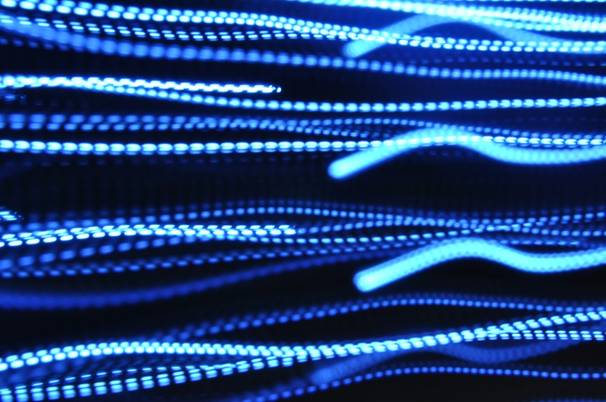 Verv has developed technology for collecting high frequency electricity data that is far clearer and more detailed than what smart meters deliver because it samples up to 5 million times faster. The potential social impact is significant. In Davies’s words, “We’re democratizing data; unscrambling vast amounts of data from electricity usage and handing it back to the user in a form that helps them actively create positive change.” Power to the people! Literally! Energy production and use is the largest source of global greenhouse-gas emissions, and greenhouse gases from human activities are the most significant driver of observed climate change since the mid-20th century. Traditionally, electricity demand increase has been coupled with economic growth. This is still the case for China and India. But not the US. In the US, GDP and electricity demand have been decoupled for ten years and last year demand was actually stagnant. This is thanks in part to the outsourcing of heavy industry but also to greater energy efficiency, the kind of thing Verv enables with its Home Hub, and to customers generating their own power, something Verv encourages with its recently launched Verv Trading Platform. Verv has combined deep learning AI with blockchain technology in order to allow consumers who generate green energy locally to share their excess energy with their neighbors and community at affordable prices in exchange for a token. AI is used to forecast supply and demand, so energy can be traded at the cheapest time. 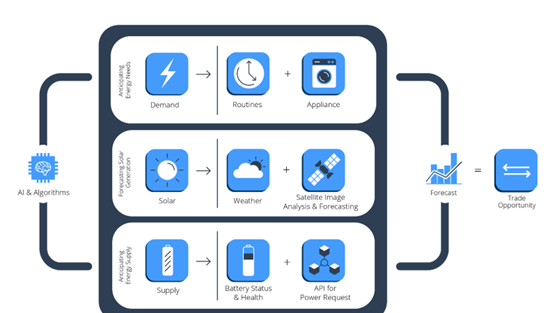 AI enables both Verv Home Hub user profiles that show who needs energy and when, and anticipation of energy power generation from satellite data about cloud cover. Blockchain technology provides a secure and transparent ledger on a peer-to-peer network through which energy can be traded. By using a utility token called the VLUX to enable use of the trading platform, Verv can fund a freemium model, where participants pay no platform cost. When energy demand is low and use of grad infrastructure is minimal, a user with a battery can store energy free of charge for later use or sell it when demand is high. This, in turn, helps with load balancing to the grid and avoids the need for additional energy generating facilities. The battery owner doesn’t even have to own a source of power. Users also benefit from improved grid resilience made possible by the fact that a decentralized/distributed energy grid has fewer points of failure than the traditional centralized infrastructure. The Verv trading platform executed the UK’s first energy trade on the blockchain in April 2018 at a public housing community in Hackney London, where solar panels had been installed on 13 blocks — powering the community with sunshine. That trial was expanded in November when Centrica, the parent company of the UK’s largest energy supplier, British Gas, joined the trial to explore how to bill customers if solar panel owners sold excess energy to their neighbors. The test will analyze the amounts of consumed energy coming from British Gas and the amounts from solar panels.